inKLEINations: Blessed to be a blessing! It is the eve of the eve of CocoaConf, and we are bustling here, ready for a wonderful several days in cool Columbus, Ohio! We are once again seeing the Lord bring together a lot of details for us in this upcoming event, and it reminds us of the ways in which he brought things together for our family's homeschool conference activities. Things really get cooking for us in June! forming a springy, bouncy trampoline on which to bounce -- boing! Our purpose for going to the homeschool conferences, offering Christian literature and occasionally speaking, is to meet new people and help build up other families. In the process, we gain a lot of encouragement ourselves! If the Lord tarries, we still have many homeschool years to go. We can claim no credentials, but we just have a desire to share what the Lord has been teaching us. This year we expanded our conference coverage by a whopping 33% by adding a new conference to our schedule! It takes everyone working together to get our tribe out the door! Sarah is getting pretty good at thinking through our lists in advance. That saves a lot of headaches! It's a bus thing....mapping out the storage plans for the seat storage. Producing copies of the booklets at our table. Some are articles we have written, most are by others. Many of them were written by our friend, Art Dappen, who went to be with the Lord in 2006. His family had a ministry based in Mexico, and so the articles were all written originally in Spanish for Christian parents in Mexico. 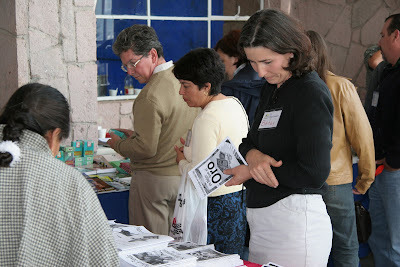 The Dappens had literature tables at the homeschool conferences in Mexico, and folks could select from the various titles at their table. Through this and other ministries, they met and encouraged countless Spanish- and English-speaking families. Art Dappen had the discernment to see the educational idolatry which was supplanting the discipleship emphasis in Christian homeschooling. What began, for most families, as an exodus from a godless institution has, in many places, evolved into a sure-fire attempt at getting kids into better universities (and at a younger age!) and high-paying careers. We once thought Art's view was prophetic. (After all, he preached against television in Mexican towns that didn't even have electricity yet!) But we have since discovered that there were many similar voices pre-dating Art's! We are currently working on an abridgment of a work by William Cowper, written in the 1780's, which offers many of the same Bible-based arguments against institutional schooling offered today! Cowper pointed out the educational elitism of his day! We were amazed. John Bunyan, the "uneducated" author of Pilgrim's Progress, was spurned by the educational elite of his day, who insisted he must have plagiarized his best-selling allegory. However, because he didn't know languages, and had read almost no other book than the Bible, their accusations were pretty weak! Anyway, we saw the tremendous potential in sharing like this at homeschool conferences, and when the Lord moved us north in 2006, we took the opportunity to do likewise. Since we don't sell anything, we have lots of opportunity to just talk with parents without them feeling some pressure to buy. It is so neat to hear what God is doing in the hearts of so many young families! Producing the literature involves significant time folding and stapling, which allows us to employ some of the dominant skills in our family! Hannah inventories each document so we can figure out how much to print of each. We have a collation station. Through this exposure, our children are becoming discerning about the things they hear. Sammy employs a special crease-forming tool, technically known as a teaspoon. Piles and piles of paper! The, um, open and spacious floor plan of the bus (read: unfinished) gives us flexibility to bring whatever we need from home, from tents and sleeping bags, and folding tables, to the mint condition sofa sleeper we find on the side of the road! We are getting a little more organized with each conference, and we LOVE that we have plenty for everyone to do. It becomes a family effort. From printing, to proofing, to matching socks, to burning CD's, to Gorilla-gluing the covers, to folding and stapling, to scooping ice cream. Everyone gets involved. Just getting the clothes packed takes a few weeks! We lay out everyone's wardrobes in the den, and Sarah checks off everyone's list to make sure we don't run out of socks or anything. Non-stop laundering is employed during this phase — just like every other day! Throughout the year, we pray for our homeschooling brothers and sisters to press on and be encouraged in the Lord. We pray that the things we have been privileged to share, things which the LORD has shown us and helped us in our j o u r n e y, will be a blessing and produce good fruit in their families. We are up against a formidable enemy who wants to destroy families from every angle. But if we stay in God's Word, and teach our children to do likewise, the enemy is no match. "...Not by might, nor by power, but by my spirit, saith the LORD of hosts."